This post was created by Kyle Gilreath. He is NBA Client Services Manager for FastModel Sports. He is the Head Basketball Coach at Astronaut High School in Florida. He served as an undergraduate manager as well as graduate assistant for the Florida Men’s program under Billy Donovan. 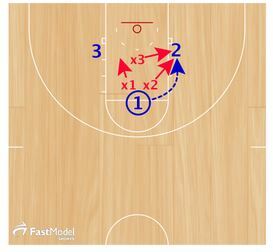 I found the drill on FastModel’s plays and drills library. This is a great offensive and defensive peer pressure drill that can help your players improve their toughness. x1 and x2 trap 1. 1 must be strong with the ball trying to pass to 2 or 3. 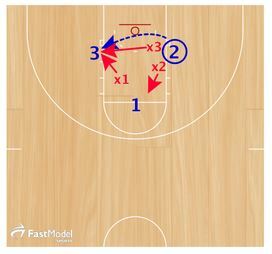 1 must utilize pass fakes to lead x3 and pass to the open man. If 1 passes to 2, x2 and x3 become the new trappers. Drill continues until the defense gets a deflection or causes a turnover.